Nearly three years ago I wrote a little blog post about the MUTR micro rover kit which I'd just received then. I put together a basic rolling chassis then but then got distracted and didn't do anything more with it - until this opportunity came up. Enter Robot Hackday, a day organised by MadLab and HacMan. People bring down old electronic junk and attempt to make automata out of them. We succeeded in making an army of wonderful robots, from scribblebots and shaking Altoids tins to furry tanks with glowing eyes. It was great to have a bit of banter with other hackers as we tried to get a robot ready within the day. One of the special guests this year was Tim Hunkin, a hero of mine since he presented The Secret Life of Machines many years ago. Tim's a really friendly chap and he spent ages helping me get my robot working. 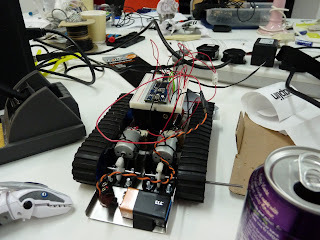 In the photo is WrigglyBot, the robot I built on the day. I seem to have been photobombed by a robotic raptor. Someone else there (I forgot your name, sorry) named it as the front of the chassis ended up low enough to the ground to scrape chewing gum off the floor. The axles needed trimming to fit both gearboxes side-by-side, and then I drilled holes for the rear axle and redrilled the rear wheels so they were loose on the axle. There are three relays controlling the motor, one does the forward/reverse control for each motors, and the third is the main on/off control for both. As it stands, it can't run just one track at a time. The relays are switched by the ever popular ULN2803 chip, and the whole caboodle is orchestrated by an mbed board. This is the first thing I've used an mbed for, and apart from a minor panic when MadLab's wifi left me without access to the mbed online compiler, it worked very nicely - certainly a lot less hassle to program than my usual microcontrollers. There's two batteries on board - the main 4x C cell runs everything, and would have run the mbed but it kept resetting when I switched the motors on, so I put in a separate 9v battery to run that. The only problem is the clip-in worm gear sets. The worms tend to rise up when the gearbox is put under strain, and this will strip the gears if allowed to run for too long. Mine was still slipping despite lots of Araldite and wire holding the motors down. I think they need something to hold the worms down at the front. Thanks to everyone at MadLab and HacMan, that was a great day out.